Conversations – A conversation is defined as any interaction, relevant to the concept of TheHydrogenBike with any person in and around the bike during one of the displays. Bike Interaction – A Bike interaction is any person who gets on the bike during a display. These numbers should be displayed at on the individual event reports. These are published on the event posts and totalled on the right hand side of the website. We do not save any personal information beyond photos. All statistics are non personal and should not be inferred back to individual participation / opinion. 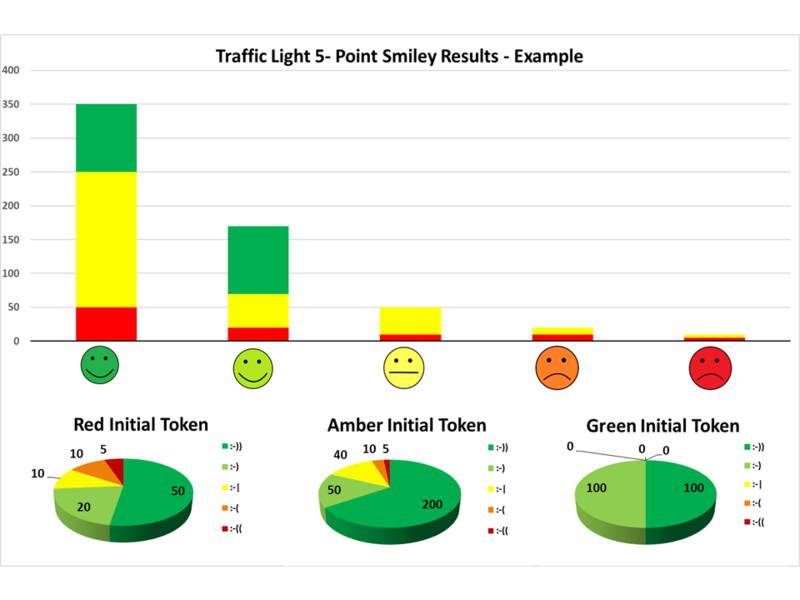 This page explains how we use our traffic light to 5 point EmoJi impact assessment system. The system is designed to measure the IMPACT of TheHydrogenBike display. Therefore we need a baseline from which to measure change. Pre- Assessment Opinion of hydrogen before the discussion or display. This is self assessment using a simple three coloured token concept based on the traffic light colours. 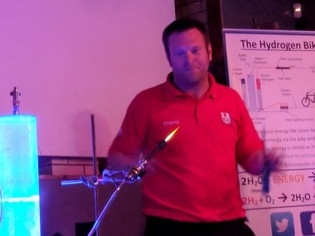 RED – I know about hydrogen and my opinion is broadly negative. Amber – I have no knowledge or opinion on hydrogen. Green – I know about hydrogen and my opinion is broadly positive. Note that you may get the old tokens in which case you choose Grey, Pink and Blue. Post Assessment Opinion of hydrogen after the discussion or display. How do you feel about Hydrogen powered future? We try to avoid influencing the respondent in which tube to deposit their tokens. These are shown graphically as a bar chart, broken down into the three initial colours for the pre-assessment. Above is an example of a hypothetical data set from 600 users. Red tokens in the green EmoJi indicate a positive impact on public opinion of hydrogen. 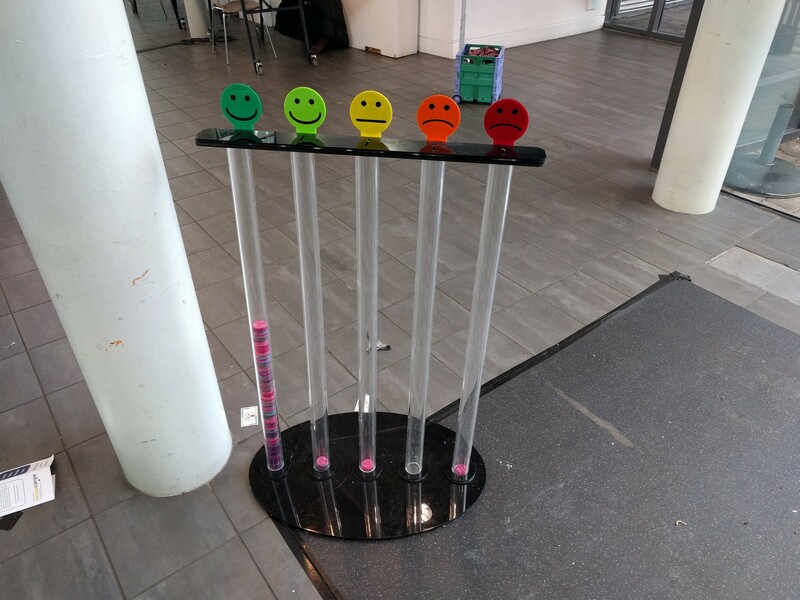 Yellow tokens in any column other than the neutral yellow column indicate an impact where by someone has learnt something and developed their own opinion, good or bad. Red tokens in the red and orange emoticon and green tokens in the green EmoJi indicate a reinforcement of opinion. A general skew of tokens falling into the green EmoJi indicates that public opinion is largely positive about the use of hydrogen. Please note that the EmoJi system is no longer an assessment of US but an assessment of public opinion towards the use of hydrogen technologies.